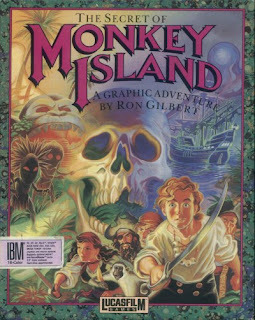 If ever a game was guilty of drawing me in for an afternoon of swashbuckling pirates, belly-laugh inducing humour, Caribbean Reggae music and fighting with insults, this was it. For me, it was one of the first adventures to truly draw me in and involve me, make me feel a part of it… make me feel like a grog-swilling filthy pirate. Conversations are something you’ll be having plenty of in this game, and a very careful balance of wittiness without being over the top is struck and maintained throughout the entire game. 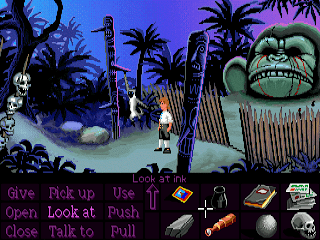 As you become a pirate, you meet a beautiful governor and make an enemy or 2 along the way, namely Fester Shinetop, the local law enforcement officer, and LeChuck, a ghost pirate who is in love with the governor. 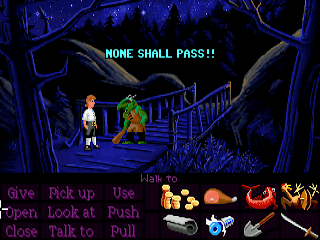 As you can imagine, your interest in the governor does not seat you in favour with LeChuck, with hilarious results. 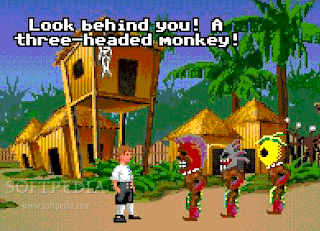 By the time you become a fully-fledged pirate, you’ll already have passed one of the most ingenious moments in gaming history… Insult swordfighting. Never before and never since has a combat system been so original, so hilarious and so frustrating. The basic premise is that your swordsmanship skills will only win a battle coupled with the right insults or retorts. 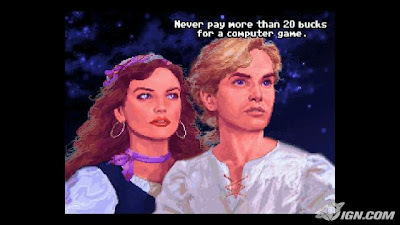 Unfortunately you have to learn them all, which means relying on other pirates to insult you in a new and wonderful way, and then hoping you get the chance to use that insult elsewhere, and hopefully learn the best retort to said insult. After a good hour or two, eventually you’ll be told you’re good enough to beat the Swordmaster, who uses a completely different set of insults, but hopefully by this stage one of your retorts will sound half decent and eventually you will win the fight. How appropriate, you fight like a cow! My last fight ended in my hands covered in blood! Hopefully you’ll have learned to stop picking your nose! If they’re not entirely accurate, never mind, you get the general idea. Normally what I’d do is play through the game again and check it, but I’m loathe to immerse myself into the game again. Several reasons for this, 1 is I’d never get this review written, and 2, I’d end up giving away far too much for you to get into the game yourself if you decide to see what all the fuss is about. For that reason, I’m going to give no further plot or surprises away here, you’re just going to have to try it for yourself. Puzzles and character interaction come with alarming regularity, but there’s always a fairly obvious solution as to what to do next. Sometimes a little lateral thinking is all you need, and there’s also a few in-jokes that will make you laugh till you spit your coffee. As for sound – a lovely mix of Caribbean lilt and atmospheric tracks keep you company throughout the game, music which I enjoy listening to even now!